Been a bit quiet on the progress reports lately, mainly because, there isn’t a whole lot of progress to talk about. As Steve pointed out… that’s exactly right. Which is why I’m seeing the psychiatrist in the first place. Of course, that wasn’t actually what I meant… I thought she was going to say I had theoretically built up my problems to the size of Australia, when really, they’re only the size of Tasmania. In actual fact, she turned out to be quite agreeable, didn’t decide to commit me the minute I walked in the door and burst into hysterical tears, and reassured me that my problems, are, in fact, as significant as I imagine them to be. As she pointed out (along with the Evisceration Expert – I’ve decided they’re in cahoots) I’ve built up these issues over three to four decades. Nobody is going to resolve them in a few weeks. The concern is that my anxiety/panic attacks/OCD are still completely out of control, so a new medication has been added to the mix. It’s actually an anti-psychotic drug (Steve wanted to know if I took enough of it, would it MAKE me psychotic 😛 ) but in actual fact, while I’m not psychotic, in small doses, this medication does help people suffering severe anxiety issues to function more like normal human beings. So far, it seems to be giving me some assistance, although it’s early days yet and if nothing else in the past six months, I’ve learned to take each day as it comes and deal with what I’m handed on any particular morning. I’ve come to an epiphany regarding my old medication, which I was on for fifteen years. It wasn’t really keeping the anxiety/stress/OCD under control. We (me and the tribe of health care experts) think perhaps I had reached extremely high pinnacles of stress and anxiety without medication at all, and the old meds brought that down to a more reasonable level. Nowhere near ‘normal’ but in my head (given what I was working with ‘before’ and ‘after’) I thought I was ‘better’. Now though, I’m realizing that what I was considering as normal, or better – was actually still quite manically anxious. (Kinda like I used to have a full cup full of stress, and with the other medication, it brought it down to half a cup of stress. It wasn’t better, but to me, at the time, I thought it was MUCH better than what I’d been dealing with… even though it really wasn’t fixing the issue). I was explaining how my brain seems to work to my son and then my SIL – and then to the tribe of health care experts – and apparently, I’ve discovered it isn’t entirely normal. But to me, it was. My analogy, was that my brain works a bit like the tsunami did in Japan – remember that piece of video? The one where the water is spreading across the farmland… and it’s brown and churning and filled with debris and detritus and cars and pieces of roof and buildings and bikes and furniture and everything else it had picked up as it roared across the coastline? That’s my brain. Every minute, of every day, of every week, of every month. Day and night, week in, week out. Picking up new information, adding it to the already filled receptacle, smashing pieces of every aspect of my life into one another as it moves relentlessly around and around in my brain, like a tsunami struggling to go down a drain, but it can’t. Now, with the new medication, I’m experiencing moments of languid peace, in which I’m not really thinking about anything. I’ve had moments when I’ve realized that there isn’t one muscle in my body which is tensed to the point of pain. I’ve watched some shows from start to finish and been surprised to recognize that I’d actually ‘zoned out’ and not been stressing, worrying, fretting or panicking, and have in fact, seen a whole show. It’s been quite amazing, I can tell you. Exhilarating in some ways, but terrifying in others. It gives me hope that I might one day get to the point where I can live life calmly and logically, and get back to a relatively normal lifestyle. Terrifying, because I’m anxious that this might not last, or might stop working, and I’ll go back to being as I was, all the time. Or that this is as good as its going to get, and its not enough yet. Went to the psychologist today (told you I’d cornered the psych market) and she’s pleased with how I’m progressing. I’m gaining some mastery of the breathing exercises, and I’m starting to learn how to ‘talk myself down’ when the panic becomes overwhelming. I’m not always successful, but sometimes I am. And today, we add a new weapon to my toolbox (which I had to take a photo of, because I love the word!) 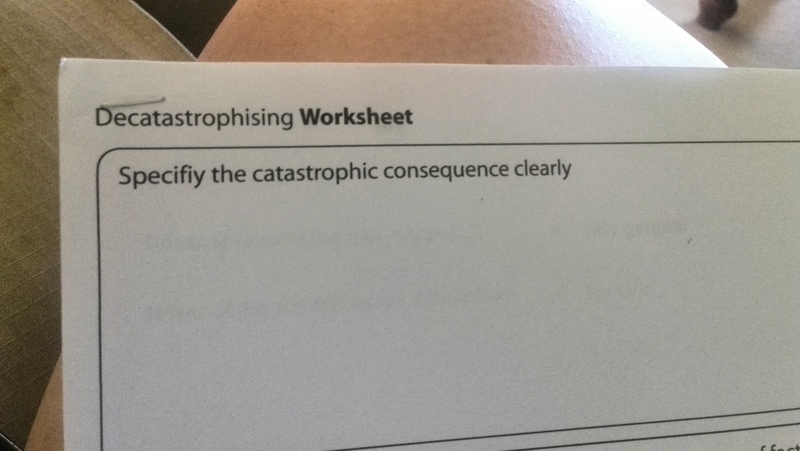 – I am now going to be using ‘DECATASTROPHISING WORKSHEETS’ so that when Plan A or Plan B doesn’t work, I can move onto Plan C and work though the anxiety in writing, work out what the trigger point was, what I’ve decided are all the worst-case scenarios, and then how I can overcome the anxiety and rationalize until the catastrophe which is in my head, is averted. So that, in a very long nutshell, is an update. I too was undiagnosed for decades, not aware of how bad I was until I collapsed in my GP’s office. Antipsychotic medication, serqouel, has brought me firmly back into reality. No more delusional belief systems and normal relationships with others. The right medications can give you a more normal life, but as I found out the wrong ones can just increase the living hell.